Getting in shape always seems like a good resolution, no matter the time of year. If you want to be healthier and feel better about yourself, doing some work at a fitness center can certainly help. However, for many people the resolution stops at the first obstacle. 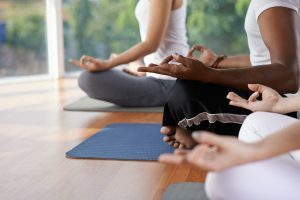 Without the right motivation, you may find yourself avoiding your commitment to improve yourself with excuses like “no time, “too much work,” and “not getting anything out of it.” Joining a yoga training program can help you overcome those objections and set you on the path to a better you. Learn the benefits of a program at a health and fitness center in Phoenix, AZ. Getting in shape means working on your physical appearance and flexibility while recognizing what your body is trying to tell you. Too many people believe that no pain equals no gain. Yoga goes against the grain and asks you to look inside yourself and feel what your body is telling you. When you know more about how your body communicates, you can do yoga exercises in ways that will benefit you the most. In time, you’ll become stronger and more flexible. As you improve, you’ll see the pounds melt away. While your physical health is important, your mental health will allow you to continue going to your yoga training program. Yoga helps you relieve stress through movement and meditation. It allows you to empty your mind and achieve clarity while you practice mindfulness on the mat. Yoga involves not only connecting to your body and mind, but it is also involves connecting you to the earth and your spirituality. Many people draw strength from the guided exercise of yoga training and how it interacts with their spiritual beliefs. When you join a yoga training program, you’ll meet others who have similar interests. You can build a support group for your yoga habit and find someone who will help you keep going to the program. People are the most important part of any program, and yoga’s no different. The best part is that you don’t have to be an expert to join a class. You just have to be willing to try and to adapt the exercises to your current ability level. Yoga points out how amazing you really are. Most people are mired in thoughts of inadequacy. With yoga, you can learn to tame the monkey mind and find out what you’re truly capable of if you keep with the program. If you’re looking at fitness centers in Phoenix, AZ, for your yoga practice, Mountainside Fitness is your best option, with over 17 locations in the Phoenix metro. We offer family fitness classes and places for your children to stay while you’re working on being healthier. Come in for a five-day trial period to find out how we can help you be healthier and happier.